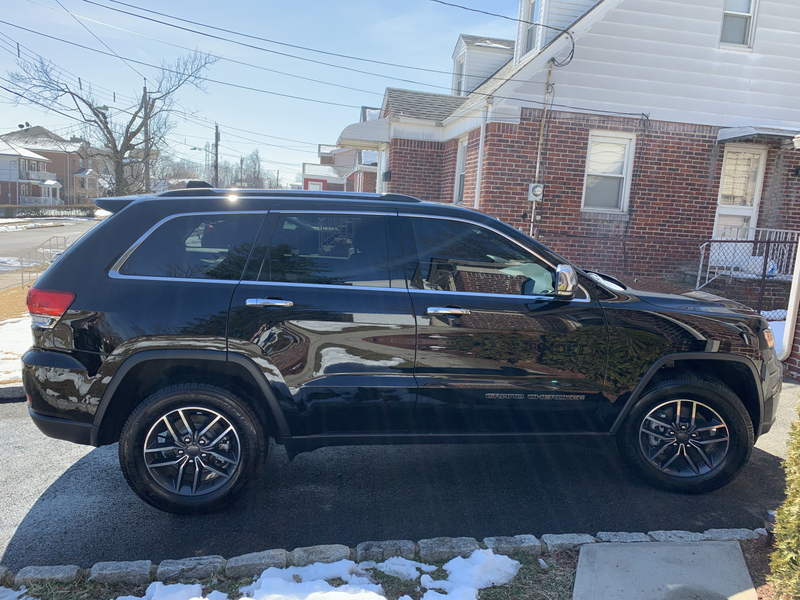 Keep your 2011-2019 WK2 Jeep Grand Cherokee looking new and free from scuffs and scratches with Door Sill Guards available at JustforJeeps.com. Don't let your interior door sills get scratched up when you want to keep your baby looking as new and as free from blemishes as possible. 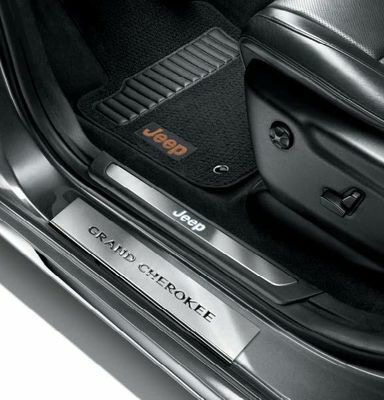 You get four sills to a set, with the logo of the Jeep Grand Cherokee adorning the front sills. 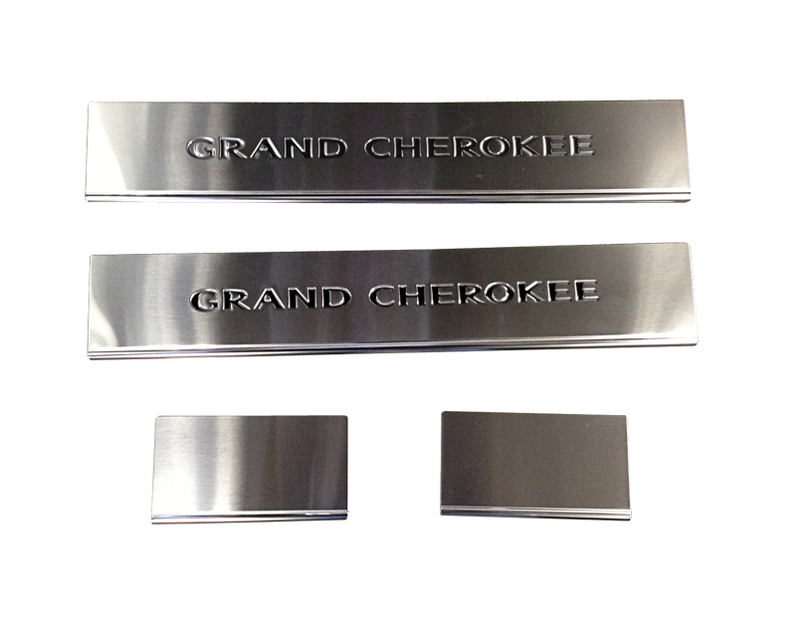 These Jeep sill guards are made of brushed stainless steel and really make the interior door sills look sharp. Comes as a set of four door sills. 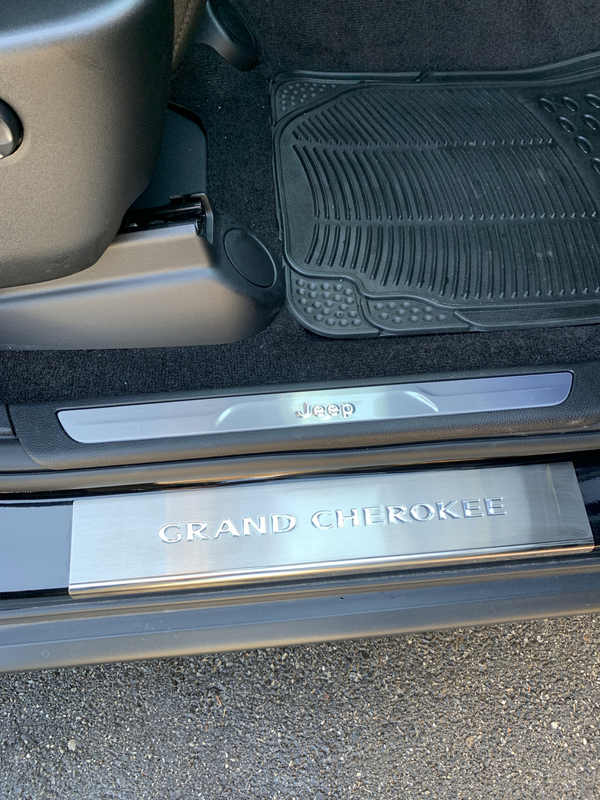 Grand Cherokee logo is only on the front sills. It was easy to install. I recommend that you use a space heater or a heat gun to warm up the 3M tape on the back of these and on the car frame if you're installing in cold weather. It will make a big difference in how good it sticks initially. Overall looks great and protects the jeep against scuffs getting in and out. Makes the door sills look clean and well worth the price. Easy to install on all four door sills. Fit and finish are perfect. They look great! Unlike some, I did install the rear guards - they are as big as they can be for the size of the opening. Both front and rear look great and add a nice touch that should have been there from the factory. The sill gaurds look nice on the front. The back gaurds are really tiny and don't do much to protect the sill. The item was received in great shape and no with no damange. The biggest issue I have is the price. The profit margin must be incredible. ConsSmall rear door Sill plates and the price. It's way too high for what you get. 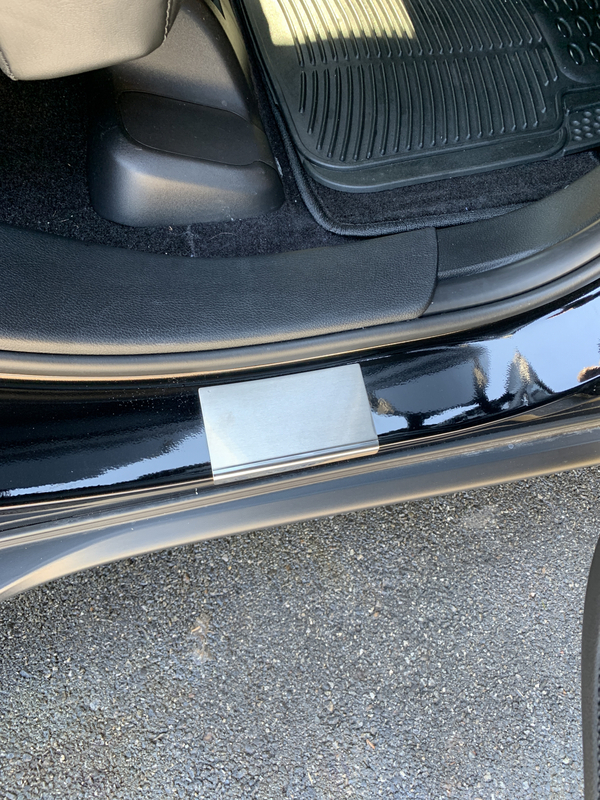 The door sill guards look sharp(as in classy) and were easy to install. ConsShould not cost this much. Great S.S. door sill. 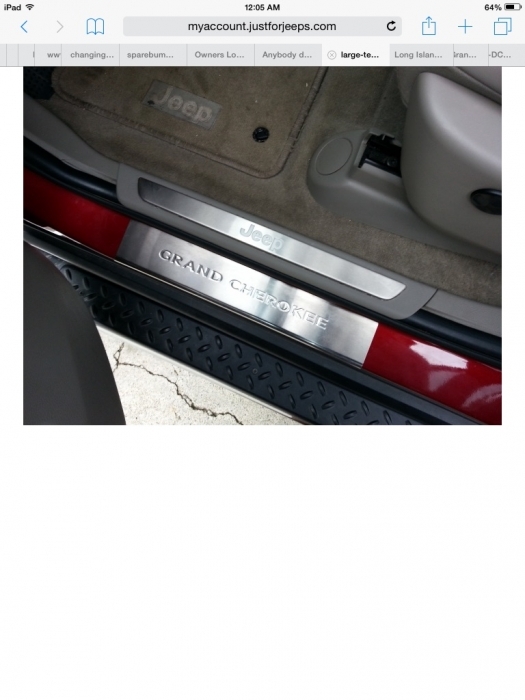 they have Grand Cerokee engraved on them the greatly improve the appearance of the vehicle onbce you open the the doors. The front are exactly the correct size however they could be contoured as the Jeep sill plate is. ConsRear needs to be twice as long. They’re a joke when it comes to functionality. 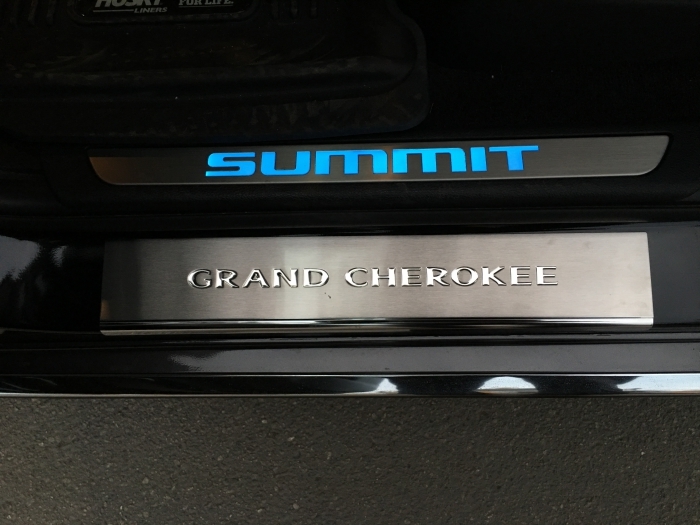 I have a black 2016 Jeep Grand Cherokee Summit and these sill guards really look good next to the lighted Summit plates inside the door , really gives my truck a unique look !! See the picture below. ProsFit is perfect. OEM. Easy to install. Looks great. They look nice and classy. My only issue is the color is slightly off from original jeep sill guard, and WHY are the backs so tiny? The trim looks good but the rear are too short. Wouldn't spend that kind of money again on another set for my other vehicle. They are not worth the price! Good looking. A little pricey. ProsGood look.adds a little extra to the door seals. ConsBack seat guards too small. Price. Nice stainless steel. Fit was good. Installation was easy. I augmented the adhesive strips with 3m auto emblem adhesive to better secure them. Bought these for my new 2017 Jeep GC Summit and they look awesome! They make the Summit look even more classy inside when you open the door. Jeep should include these when you buy the vehicle. The back door sill guards should be a little bit longer but overall they are okay. I just put them on my new 17 Overland they add that special touch. First things first. On 50k Jeep these or something similar should be standard. That being said these are well made, easy to install and look great. How well they hold up or the double stick tape lasts will be determined later. If purchase again. back door piece is a joke. is of course the one that gets scratched the most from my dog getting in and out. ConsBack pieces not big enough. Plenty of room for more. The front door sill guards look nice and were very easy to install. The rears are very small and could have been several inches longer, which would have made them look better and more functional. I installed them anyway because I do have passengers in the rear often and I wanted any amount of protection I could get. Otherwise, no real issues. The fronts look good and are protecting the door sill as evidences by some small scratches on them vs the painted sill. ProsFronts cover a functionally large area of the door sill. Were very easy to install. Look good so far. ConsRear door sills are way too small (not wide enough).